It’s been a disappointing start to 2016 after such a great finish to 2015. After finishing fifth in my first event of the season before Christmas, I came out slow in January with my game being rusty after the break. I actually played nicely at Abu Dhabi, which was an amazing experience and one of the best events I have played, especially with Spieth, McIlroy and Fowler at the top of their game. It’s a long course and I just didn’t score well enough, missing the cut by one. Dubai was also a great event, one that I felt great going into as my preparation went very well, but it’s strange in this game, sometimes things just don’t happen as you expect. I have just come back after being out in Thailand and India and battling the jet lag. 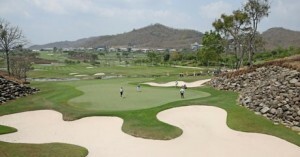 Thailand (Black Mountain course below) was the hottest conditions I have ever played golf in. Friday morning there was no breeze at all and it was unbearable at times. India is always an interesting place to go and it always hits home how fortunate we are when you see the amount of poverty. As for the golf course, it is the tightest and shortest course we play, so one that suits my game. But it only takes a slightly errant shot and you’re in snake infested bushes! I’ve been playing well in places, but a couple of poor holes have left me around the cut mark most weeks, especially as I have not been scoring as well as I normally do. When you’re around that mark and start thinking about it, it’s easy for a few mental errors to slip in. I’ve been clocking up the air miles with events in South Africa and across the Middle and Far East. But for those not in the WGC events or the Masters, there has been a three week break in the European Tour schedule. This has been great to get that perspective back with sometime off doing normal things with the family. While I’ve been taking time off I still seem to be down the golf club everyday with Teagan and Oscar. 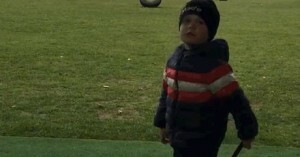 They both are hitting it nearly 100 yards already and Oscar in particular, who is only four years old, is extremely enthusiastic. Something I hope will rub off on me over the next few weeks! He won’t take advice from me though, but is at that age when he wants to do everything daddy does, so I have to hit shots too! I also had a meeting with my team over Easter to go through a few things before we get back on the road. It was a very productive meeting looking at what’s worked and what hasn’t and how we can improve for the next few months. In my second week we’re off to Ireland, so I am looking to sneak a round in at The K Club with the Irish Open being played there. It’s then preparing for the resumption of the tour, mainly at Marriott Tudor Park and Littlestone Golf Club. Next up for me is the Spanish Open at Valderrama. It’s a testing course as it’s very tight, with positional play off the tee very important. It’s a course that will suit me. It is then off to China for two events before being back in Europe. After securing my card last year I have had the luxury of being able to plan this year in advance, which is a first! This has enabled me to take in some other sporting occasions for a change. On my brother’s birthday we managed to see our beloved Spurs against Fiorentina, which was a great night. Now it’s all eyes on whether they can win the Premiership title, which as a traditional Spurs fan I am surprised to say! It is something my psychologist and I have spoken about as he’s a Spurs fan too – but works with Leicester City! Although nobody would be disappointed in that story, if they won. I also got to go watch England v Ireland in the Six Nations with the wife, who is very proudly Irish. At least one of us won! I loved both games and it was great way to have some fun and switch off from work. I don’t buy myself any clothes or extravagant things, but I did promise myself last year, that when I secured my card I would organise a new car. I’ve never had anything close to new car, let alone a decent new car. Like most, my earnings always go in the family pot to cover the bills and I rarely see any of it, hence I made the promise to do this. But I had to wait till the last event! But I did it, so I have leased a Mercedes AMG for the year. I picked it up last month and it is fantastic. I have a beaming smile when I drive it and even just look at it! There are some very strict rules with the kids which includes them taking their shoes off. My wife finds this all very funny as I am not so strict in the house! 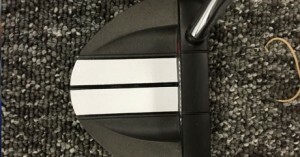 I’ve had a new Odyssey putter made recently, which is great and I hope it works! It’s pretty similar to the one Brandon Grace uses, but with the white and black in opposite positions, hopefully it will be as successful! I have gone for this to try help my tendency to aim left with a stronger visual line. I had it in the bag in Thailand…but only because I had to! As I had been practising with it in Dubai, but was struggling with my luggage allowance to Thailand. So I sent the old one and my spare driver home to ensure the bag made the weight! Finally, it’s the Masters next week and I’ll be watching it like everyone else! It’s one of my favourite tournaments and hopefully a European will win. I’m looking forward to seeing how Andy Sullivan and Danny Willett do as they have been in great form in Europe. Of the big names, Jason Day will be difficult to beat if he plays anything like he has been and Adam Scott is in good form and a past winner. While Jordan Spieth isn’t quite in the form he was when he won last year. It’ll be interesting to see what happens.